Afraid to take the dive and start composting? Relax, the Modern Farmer guide to composting has arrived. There are two main ingredients in any successful compost pile: carbon-rich ingredients and nitrogen-rich ingredients. The carbon camp is often referred to as “browns,” because it include things like dried leaves, dried grass clippings, cardboard, and straw. Nitrogen-rich “greens,” on the other hand, include fresh leaves, fresh grass clippings, and vegetable scraps; the name is a bit of a misnomer, however, as manure, a very nitrogen-rich substance, is also included in the green camp. You’re going to need at least one source of each for your pile. Pro Tip: Always start a new compost pile with a fluffy layer of browns on the bottom (at least 6 to 8 inches deep) to absorb moisture from the pile and keep things well-aerated, thus avoiding cesspool conditions. The magic that is composting rests on the interaction between carbon compounds (browns) and nitrogen compounds (greens). Any pile of organic matter (translation: this means formerly living things, including all compost ingredients) will eventually decompose and feed the soil, but when the ratio of carbon to nitrogen in a compost pile approaches 30 to 1, the decomposition process rapidly accelerates as “thermophilic” bacteria move in and the pile heats up to over 160 degrees Fahrenheit. Pro Tip: Check out this handy list of the carbon-nitrogen ratio for various compost ingredients to get a general sense of how much of each to incorporate into your pile. There is no need to get out your calculator to know whether you’re striking the right balance carbon-nitrogen balance. When the ratio is lower than ideal (too much nitrogen), the pile will be slimy and stinky; simply add carbon. When the ratio is higher than ideal (too much carbon), the pile will be dry and very slow to decompose; simply add nitrogen. In general, carbon-rich materials should form the bulk of the pile. A good rule of thumb is that each time you add a batch of nitrogen-rich ingredients, add roughly 4 times that amount in carbon-rich ingredients (in volume, not weight). Pro Tip: Always add nitrogen sources (manure, kitchen scraps) in thin layers, not little piles, so that all the material is in contact with carbon-rich browns. In general, it’s best to err on the side of too much carbon in a compost pile. The worst that can happen is it takes longer to decompose. Extra leaves, straw, and grass clippings, especially when used on the outside of the pile, reduce odor and improve aesthetics. You can think of this almost as a covering, with the composting activity occurring below; pull it back each time you had a new layer of compost materials. Aim for at least 3 to 4 inches thick. Pro Tip: This outer layer of carbon won’t readily decompose, so just strip it away once the interior part of the pile has turned into dark, crumbly compost and use it as an ingredient in your next pile. The perfect compost pile is like a rung-out sponge – moist, but not soggy. Many composting websites will tell you to water your pile in dry weather and cover it in wet weather to keep the rain out. But if you maintain a thick outer layer of carbon-rich material, which helps to prevent rain from soaking into the pile and moisture from evaporating out of the pile, conditions inside should stay just right – as long as you have the ratio. This is because the nitrogen-rich materials, which are generally moist, are perfectly balanced with dry carbon-rich materials when combined in the 30 to 1 ratio. 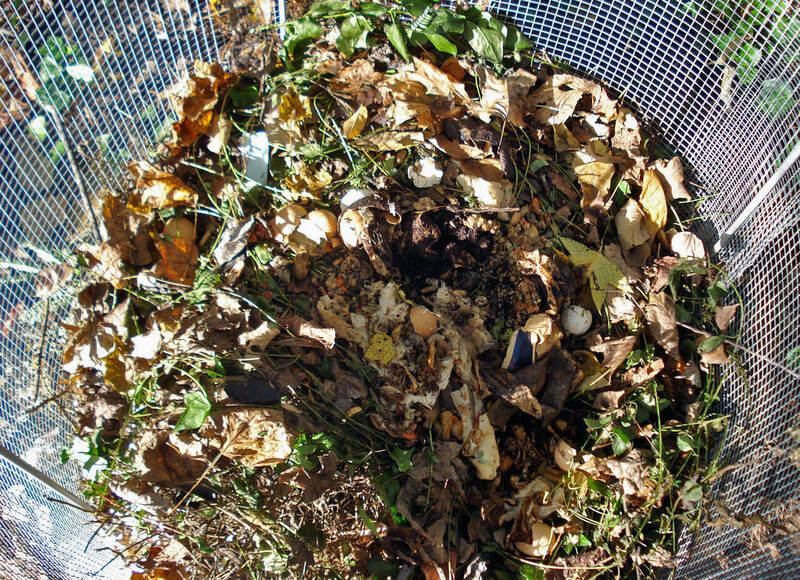 Composting success is a matter of getting the feel of your pile and fine-tuning it by adjusting the ratio of greens and browns. You don’t need books, thermometers, fancy compost bins, kelp, microbial inoculants, or master composter classes (yes, this is a thing). You just need a little time to experiment, and the willingness to let the pile tell you what it needs. As an example, many composting websites urge you to turn the pile with a pitchfork to introduce oxygen, which helps the right bacteria proliferate and prevents stinky anaerobic conditions. However, you can skip this laborious step – which also makes a mess and brings uncomposted kitchen scraps to the surface – by using lots of dry, fluffy leaves or straw ion the pile, which by nature hold lots of space for air. Pro Tip: Rather than store bought inoculants or “compost starter,” sprinkle a bit of finished compost on at the bottom of the new pile to introduce all the right microbes. They’ll show up anyways if you provide the right conditions, but this gives them a head start. Composting jocks will tell you, as they look condescendingly down their nose, that it’s possible to build a big fat compost pile and transform it into black gold in a few weeks. That is technically possible, though if speed is your goal be prepared to do lots of pile-turning and invest in fancy products. It should be noted, however, even once the pile transforms into a dark crumbly soil-like substance, it takes another six months to a year for it to “mature” – a second, less visible stage of decomposition when other organisms take over and further refine the compost into something truly alchemical for plants. If you’re not in a hurry (and why would you be? ), then relax; stop worrying so much about whether you’re doing it right or not; add more carbon when in doubt; and focus your efforts on enjoying this miracle of nature. Pro Tip: Now that you’ve got a grasp on what make great compost, check out our guide to compost bins to figure out how to house your pile. My compost is not breaking down. Despite trying to keep to the ratio of carbon to nitrogen and after 6 months of turning it, the compost is feeling dry. The brown matter; small sticks and stable manure have remained virtually whole and not breaking down.